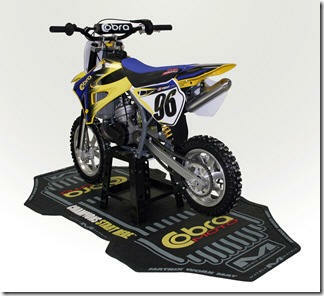 We have all the products you need for your cobra motorcycle or ATV. Many of the top factory Supercross and GP Motocross teams use custom Matrix Concepts mats in their pits…They are quite simply the best work mat available. Now you can have the same technology in your pits…Sized perfectly for Cobra bikes and customized in Cobra colors! • Gas, oil and contact cleaner resistant. • Keep parts clean and out of the dirt, or if you drop a part it lands on a soft surface. • Full 5.5ft long and 3ft wide with beveled edges. • Roll it up for easy transport – comes with netted carry bag with drawstrings. • Use it in the garage/shop in the back of your truck or at the track. • Made of tough colorfast non fade PVC material in factory colors. Molded-in color for long lasting great looks. • Easy to clean! Hit it with a pressure washer to bring back like-new appearance. The "Jimmy Hat" for your fork seals. Keeps the good stuff in and the bad stuff out! Keeps debris away from seals and prolongs seal life. 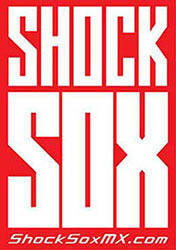 Shock Sox are available in black, red, blue, yellow, orange, green, lime green, blue camouflage, green camouflage brown camouflageneon pink, aqua and blue tie-dye. Shock Sox are a wraparound, neoprene sleeve that covers the lower part of the upper fork tube and the upper part of the lower fork tube, which provides a protective barrier around the fork seals. The lower portion pushes away dirt and debris while the upper portion has an elastic circumferential strap to help aid in the prevention of migration of the "Shock Sox". K ing Cobra of Texas is proud to announce that we have become a Precision Products dealer. The fit was right with them being a Texas company and carrying the best in Sprockets. We’re real happy to be involved with PMP so check it out and if you need sprockets for any bike big or little give us a call and we’ll be happy to help you out.